Floodgates of Heaven Devotions: Untimely Prophets for Unruly People! Untimely Prophets for Unruly People! 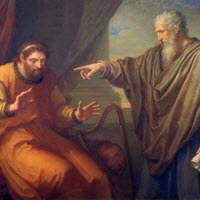 Today’s Reflection: Acts 7:35 This Moses whom they refused, saying, Who made thee a ruler and a judge? The same did God send to be a ruler and a deliverer by the hand of the angel which appeared to him in the bush. Today, we see an untimely prophet for an unruly people! Seldom does God send the prophet of the people’s choice. In fact, the very nature of the prophet by design is to be a disrupter. He is sent to be out of sync with status quo. He is sent to a people who are stubborn and stiff-necked. He is sent as a shepherd to a wandering sheep too foolish to fend for themselves. Oh, you say, but how offensive. Precisely! It is meant for you to be shaken by the raw uncut truths uttered by the lips of the God-sent prophet. When God is ready to abruptly awaken His people out of a deep sleep, He does not send those who tread lightly so as to ease you gently into consciousness. Rather, He sends one like Moses, rejected 40 years and counting, to the very people who rejected him, as if to say, “Hear him, or hear no one!” Yes, he sends THAT man; that loud, obnoxious, unwavering, rough-around-the-edges ‘John the Baptist’ type, to sound the alarm loud enough to grab not just the attention of your flesh, but more importantly, to awaken your soul. So, it is true, dear reader, that we do not get to choose the mouth piece through whom God decides to speak to us. And we had better get used to it! Most likely you will not like to hear what he has got to say at first. Most likely, you will even resent his leadership, because he will force you to face your sins, and your need of repentance. Most likely, he will be quicker to convict than to comfort. He does not come to speak words of enticement and entertainment, but words of warning and demands for change. He will heighten your awareness to a need for change that you previously didn’t even consider, but are now kept up at night over. If he does not, then he need not be called a prophet at all! What kind of preacher is this that we would want? Why, if we had our way, we would not ask for a Moses with a stern focus who would lead us to the Promised Land, but an Aaron who would give us the golden calf of our choice and just let us have it our way. GOD FORBID! Today, we must learn to appreciate, value, support, listen to, and follow the prophets God sends our way!